I read this article and found it very interesting, thought it might be something for you. The article is called 70% Of Urban India’s Sewage Is Untreated and is located at https://archive.indiaspend.com/cover-story/70-of-urban-indias-sewage-is-untreated-54844. There are four years left for the government target of ensuring all Indians use toilets, but in urban India alone, no more than 30% of sewage generated by 377 million people flows through treatment plants. An estimated 62,000 million litres per day (MLD) sewage is generated in urban areas, while the treatment capacity across India is only 23,277 MLD, or 37% of sewage generated, according to data released by the government in December 2015. That means 70% of sewage generated in urban India is not treated. While 79 STPs don’t work, 145 are under construction and 70 are proposed, according to the Central Pollution Control Board’s (CPCB) Inventorization Of Sewage Treatment Plants report. Sewage generation in India from class-I cities (with a population more than 100,000) and class-II towns (population 50,000–100,000) is estimated at 38,255 MLD, of which only 11,787 MLD (30%) is treated, according to the Faecal Sludge Management report by Water Aid, a safe-water and sanitation advocacy, quoting a 2009 CPCB report. The untreated sewage is dumped directly into water bodies, polluting three-fourth of India’s surface water resources, the FSM report said. Up to 80% of water bodies could be polluted, the report said. Operation and maintenance of existing treatment capacity is below par, with 39% plants not conforming to environmental rules for discharge into streams, the CPCB’s 2009 report said. An estimated 75% to 80% of water pollution is from domestic sewage, discharged untreated into local water bodies. Of the 522 working STPs across India, maximum are in the northern state of Punjab, which has 86. But no more than 38 work. Source: Central Pollution Control Board; (0) indicates information not received. About 17 million urban households lack adequate sanitation facilities in India, with 14.7 million households having no toilets, the FSM report said. If you consider five people per family, that means about 85 million people–or more than the population of Germany–are without adequate sanitation in urban India. In terms of rural households, only 48.4% (87.9 million) have toilet facilities as on December 7, 2015, according to a reply in the Lok Sabha, the lower house of parliament. Only 32.7% of urban households that have sanitation facilities use toilets connected to an underground sewage network. As many as 30 million urban households (38.2%), of the 79 million households with septic tanks, have no clear method for sewage disposal. 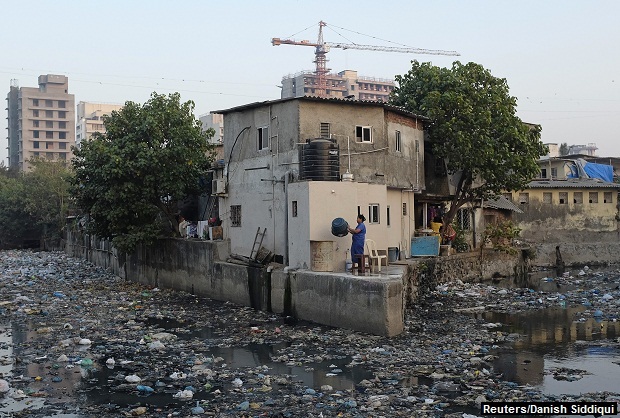 About 12.6% of urban households defecate in the open. This number is higher for slums, with 18.9% of households defecating in the open. Around 1.7% of households across India defecate in the open despite having toilets, the government informed the Lok Sabha in a reply last month, based on the National Sample Survey report 2012. Source: Census 2011; Figures in (%). In Madhya Pradesh, around 22.5% urban households defecate in open spaces, followed by Tamil Nadu (16.2%), Uttar Pradesh (14.8%), Gujarat (8.7%), Maharashtra (7.7%) and Delhi (3%). As many as 55% of rural households defecate in the open, according to data tabled in the Lok Sabha on May 7, 2015. Odisha tops list, with 86.6% of rural households defecating in the open. In Kerala, no more than 3.9% of households defecate in the open. The proportion of people practising open defecation globally has fallen almost by half, from 24% in 1990 to 13% in 2015. About 68% of the world’s population had access to improved sanitation facilities, including flush toilets and covered latrines, in 2015, according to the World Health Organization (WHO). Very good analytical article. The severity of the urban problem must be realised at the earliest. The link of this lack of proper urban sanitation and diseases must also be probed. In India, we count urban population as only people living in cities and not people having sound civic amenities. Cities in India are increasingly becoming dirtier and unhealthier, with growth in population and unchecked migration. This, in turn, is due to lack of jobs in rural areas and the unreliable agricultural profession. God knows when our politicians will focus on such critical issues. This article analyses open defecation well. However, urban slum dwellers with access to community toilets are only slightly better off, if at all, given that over 50% of community toilets are in terrible shape, leading to serious health problems, safety concerns, especially for young girls and old women, and lack of dignity. It’s safe to say that about 100 million poor urban Indians have terrible, unsafe, inhumane toilets to use. The greater crisis is the lack of treatment and unsafe disposal. Many treatment plants are not built well (thank you, L1 bidding!) or maintained properly, as they use complex technologies. High electricity bills and expensive spare parts cause these to stop functioning. We need to use robust, reliable technologies that have low O&M costs, and make environmental pollution a criminal issue as it leads to illness and deaths, and hold municipal authorities and sewerage boards responsible. Funds are now available under AMRUT and Swachh Bharat Mission; now, the will is required to do it the right way. CPCB has collected this information of 62,000 MLD from city municipal corporations or sewage boards which calculate using the 1993 CPHEEO standards of 80% of water supplied. But, on the ground, a good percentage of this is going into soak pits. In Bangalore, for example, 7 to 10% use soak pits to dispose their sewage. I would argue that the original number of 62,000 MLD can be reduced to about 55,000 MLD which could be used as a baseline for all calculations. If 62,000 MLD has to be used, then the assumption should be that these soak pits that are serviced by vehicles, funnily enough called as ‘Honey Suckers’, take the sludge and dump it into the nearest water body, which is not the case. In most cities, this soak pit sludge is used as manure in the peripheral farmlands. Nevertheless, the original point that the article makes is valid beyond any serious contention. Thanks for bringing this news out from the official documents to the masses. Forgot to add that several reports and papers have noticed that even existing operational STPs have not been performing to their maximum capacity. BWSSB in Bangalore themselves claim only 80%, which we would argue is actually 45 to 50%. Given this fact, the 18883 MLD number looks pretty conservative. But you’ve rightly mentioned “no more than”. You will hear about a series of serious efforts undertaken to rejuvenate the Bellandur lake very soon. Policy-level and technical solutions are being deliberated upon. What is the effluent discharge in the lake, and what is the capacity of STPs required to treat the sewage before discharge into the lake? Many such questions will be taken up in an open forum public consultation online. Please follow the Namma Bengaluru Facebook page. We are going on and on about Total Sanitation based essentially on flush toilets, but ignore the fact that we do not have enough water in Urban and Rural India! If 1.3 billion Indians actually had access to flush toilets, anytime and all the time, we need not fear sea-level rise in the near future! But where is the water going to come from? In much of rural India, we should be promoting dry-pit latrines which use no water really (except for washing your bottom), and last for at least 10 to 15 years for a family of five. Use of mud, ash or dry leaves makes them pretty clean and stink-free, though not fancy. I suspect that many of the in-house flush toilets built under Swacchh Bharat etc. are not used because there is no water. In a school of 500 kids, use of flush toilets is not feasible because, where is the water? These toilets become unusable within a fortnight. It is apparent that all this hype about Total Sanitation is going on because there must be lots of money to be made in the racket; otherwise, we must be pretty stupid? Water is one of the valuable resources but it is under constant threat due to exploitation for human consumption. Water crisis is global due to climate change. Water is a local resource and its effect on humans and nature is local to certain geography before it affects a neighbouring community. Most common reuse of treated sewage is in agricultural and landscape irrigation, industrial processes, toilet flushing etc. While reuse and recycle accounts for only a 30% of total sewage water, 70% has to be disposed. This water eventually enters the natural water cycle. So, there should be higher emphasis on achieving good quality of treated sewage that is entering the natural cycle than on reuse. The most practiced options of letting out treated sewage water are into public sewer, open land, rivers, lakes, water bodies and replenishing a groundwater basin (referred to as groundwater recharge). Groundwater gets replenished directly or indirectly with treated and untreated sewage water in all the above mentioned options. Efficient sewage treated water management lies in intelligently disposing the treated water so that this water is available as resource for future extraction with groundwater recharging topping the list for disposal for recreating reserves of water by replenishing and recharging the already overly exploited groundwater for re-extraction. The sewage treatment systems must be able to isolate pathogens, carbon and nutrients. While there is an emphasis from regulators for reaching low levels of carbon, referred as Biochemical oxygen demand in the treated sewage water, there is total negligence on parameters like nutrients resulting from ammonia, nitrogen and residual dissolved oxygen. Communities that reuse treated sewage water must take great care when reusing waste water since both chemical substances and biological pathogens that threaten public health are likely to be present in treated water. UV, ozone and chlorination are methods to disinfect water but have their negative effects in water when nutrients are not removed. We are already facing high levels of nutrients, especially in drinking water sources. These nutrients are essential for plant growth when the water is available in the root zone but at lower depths, nutrients remain in the water and come back to us as drinking water. There is also acute and chronic effect on aquatic systems, like the recent algal bloom, as algae use up the oxygen in the water and fish die in large numbers. The commonly installed sewage treatment plants are not capable of removing nutrients from the sewage water due to the small size and low retention time. Builders and property developers should invest time and money in getting systems and designs that have a full range of treatment in sewage treatment plant that they choose for their home owners.